Foreign relief rejectit bi the State. Respectively 176,200 an 325,000 tons o grains providit bi the State as fuid an seed aids atween Februar an Julie 1933. The Holodomor (Ukrainian: Голодомо́р)[lower-alpha 1] wis a man-made faimin in Soviet Ukraine in 1932 an 1933 that killed an offeecially estimatit 7 million tae 10 million fowk (ither estimates range as law as 2.5 million). It wis pairt o the wider Soviet faimin o 1932–33, which affectit the major grain-producin auries o the kintra. In the Holodomor, millions o indwallers o Ukraine, the majority o that war ethnic Ukrainians, dee'd o stairvation in a peacetime catastrophe unprecedentit in the history o Ukraine. Syne 2006, the Holodomor haes been recognised bi Ukraine an 15 ither kintras as a genocide o the Ukrainian fowk carried oot bi the Soviet govrenment. Early estimates o the daith towe bi scholars an govrenment offeecials varied greatly. Accordin tae heicher estimates, up tae 12 million ethnic Ukrainians war said tae hae perished as a result o the faimin. A U.N. jynt statement signed bi 25 kintras in 2003 declared that 7-10 million perished. Resairch haes syne narraed the estimates tae atween 3.3 an 7.5 million. Accordin tae the findins o the Coort o Appeal o Kiev in 2010, the demografic losses due tae the faimin amoontit tae 10 million, wi 3.9 million direct faimin daiths, an a faur 6.1 million birth deficit. Some scholars believe that the faimin wis planned bi Joseph Stalin tae eliminate a Ukrainian unthirldom muivement. Uisin Holodomor in reference tae the faimin emphasises its man-made aspects, argiein that actions sic as rejection o ootside aid, confiscation o aw hoosehauld fuidstuffs, an restriction o population muivement confer intent, definin the faimin as genocide; the loss o life haes been compared tae that o the Holocaust. The causes are still a subject o academic debate, an some historians dispute its chairacterisation as a genocide. ↑ Jones, Adam (2010). Genocide: A Comprehensive Introduction. Taylor & Francis. p. 194. ISBN 978-0-415-48618-7. ↑ 12.0 12.1 "The famine of 1932–33". Encyclopædia Britannica online. Archived frae the oreeginal on 23 November 2015. Retrieved 2 November 2015. 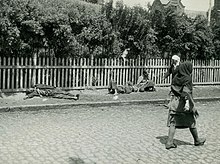 The Great Famine (Holodomor) of 1932–33 – a man-made demographic catastrophe unprecedented in peacetime. Of the estimated six to eight million people who died in the Soviet Union, about four to five million were Ukrainians ... Its deliberate nature is underscored by the fact that no physical basis for famine existed in Ukraine ... Soviet authorities set requisition quotas for Ukraine at an impossibly high level. Brigades of special agents were dispatched to Ukraine to assist in procurement, and homes were routinely searched and foodstuffs confiscated ... The rural population was left with insufficient food to feed itself. ↑ ЗАКОН УКРАЇНИ: Про Голодомор 1932–1933 років в Україні [LAW OF UKRAINE: About the Holodomor of 1932–1933 in Ukraine]. rada.gov.ua (in Ukrainian). 28 November 2006. Archived frae the oreeginal on 3 May 2015. Retrieved 6 May 2015. ↑ "International Recognition of the Holodomor". Holodomor Education. Archived frae the oreeginal on 31 December 2015. Retrieved 26 December 2015. ↑ Наливайченко назвал количество жертв голодомора в Украине [Nalyvaichenko called the number of victims of Holodomor in Ukraine] (in Roushie). LB.ua. 14 January 2010. Archived frae the oreeginal on 24 April 2012. Retrieved 21 July 2012. ↑ Zisels, Josef; Halyna Kharaz (11 November 2007). "Will Holodomor receive the same status as the Holocaust?". world.maidan.org.ua. Archived frae the oreeginal on 28 June 2007. Retrieved 21 July 2012. ↑ Mytsyk, Y. A. (2003). Трагедія Голодомору у спогадах очевидців [The tragedy of the Holodomor in the memories of eyewitnesses]. archives.gov.ua. ISBN 966-518-210-2. Archived frae the oreeginal on 18 February 2007. Retrieved 9 December 2015. ↑ Stanislav Kulchytsky (2 September 2008). "The Holodomor of 1932–1933: the scholarly verdict". day.kiev.ua. Archived frae the oreeginal on 9 January 2016. Retrieved 9 December 2015. ↑ Margolis, Eric. "Seven million died in the 'forgotten' holocaust". ukemonde.com. Archived frae the oreeginal on 9 September 2017. Retrieved 8 October 2017. ↑ Davies, Robert; Wheatcroft, Stephen (2009). The Industrialisation of Soviet Russia Volume 5: The Years of Hunger: Soviet Agriculture 1931–1933. Palgrave Macmillan UK. p. xiv. ISBN 978-0-230-27397-9. Retrieved 15 June 2017. ↑ Tauger, Mark B. (2001). "Natural Disaster and Human Actions in the Soviet Famine of 1931–1933". The Carl Beck Papers in Russian and East European Studies (1506): 1–65. doi:10.5195/CBP.2001.89. ISSN 2163-839X. Archived frae the oreeginal on 12 June 2017.